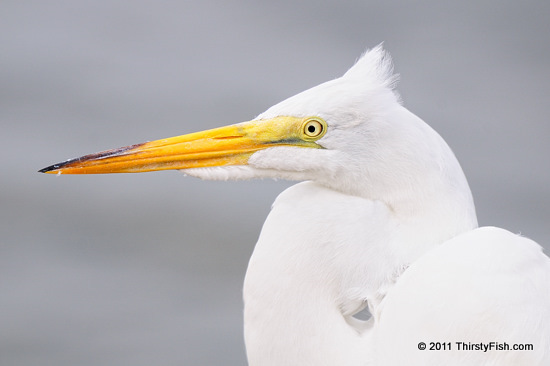 I had posted another portrait of this Great White Egret a few months ago. This one, taken a few seconds later, is better composed. George Bernard Shaw was a Nobel laureate prolific playwright, writer and socialist. He was also one of the co-founders of the London School of Economics. What is less known about him is that he was a lifelong amateur photographer and an early advocate of photography as a serious art form. He reviewed photographic exhibitions and experimented with photographic equipment and techniques: "If Velasquez were born today, he would be a photographer and not a painter". I'm not sure whether Diego Velazquez would have chosen to be a photographer rather than a painter, but, when the subject, the light, the background and color come together as well as they did in this Great Egret photograph, I do appreciate the art value of photography.